Some people dream of being in their first air race. That’s a cool day dream and there is training available for pilots who want to learn. But what does it take to race for over 20 years and consistently be in the Top 5? That takes a whole different mindset. 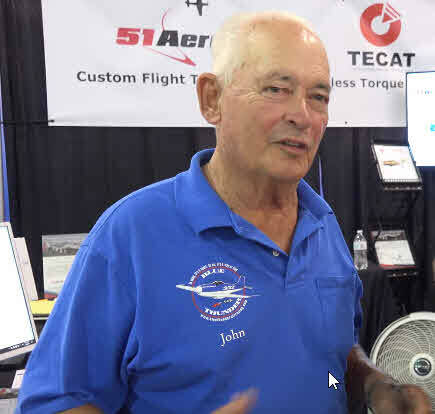 One of the highlights of our Oshkosh 2017 week was the opportunity to interview the legendary John Parker, champion Reno Air Racer. These days he is racing Blue Thunder II, a ¾ scaled P-51 carbon fiber P-51 Mustang with a soon-to-be 1,000 HP Falconer V-12 engine. John Parker is known as a highly competitive, well-respected veteran Reno Air Racer. I was curious to uncover his secret for longevity as a top racer. Lisa: How long have you been racing at the Reno Air Races? John: I won for my first event in 1977. I had been doing it for 4-5 years before that and ever since. I’ve been around for at least a week or two (lol). I’ve just sort of gone up through the classes since then. We now compete every year in the Sport Class. Our purpose is . . . winning. Lisa: What do you do to get yourself ready to win at the Reno Air Races? Johh: It starts the night before when you start thinking in terms of who your competitors are, how they’re going to react and how you’re going to beat them. Think in terms of what your strategy is for that particular race. Start focusing on your pieces of equipment so you can operate them to the maximum efficiency, get the best start you can, concentrate 150% on each particular step throughout the race. Then the race is over, the checked flag goes down, everybody is clapping. You come back, land and back to the hangar. We start asking questions like “how did you do?” We have as a sponsor, 51Aero which is a data recording system. We use the data recording system to analyze “how did we do”. We can check to see well . . . you weren’t so great on that particular turn, but you learned and were able to correct for that on all the subsequent turns. The rest of it is, the recording of how the airplane performed. We just can’t get along without knowing how the airplane performed and what we have to do in preparation for tomorrow’s race. Lisa: What’s the biggest thrill you get as a pilot year after year? John: When you are doing something and when you do it well, that’s a lot of self-satisfaction. There are people who are born for certain things. Competition and aviation are part of my DNA. They sort of melt together in air racing. As bonus surprise fellow air racer Jay Behel dropped in during the interview. Jay who races a Lancair Legacy often flies with John during training at the annual Pylon Racing School. What valuable advice has Jay gotten from John? Jay: I’ve gotten to learn a lot from John over the years. Perhaps the most important thing when we are flying formation is . . . always look good. Doesn’t matter what you do as long as you look good ?. Look up in the skies of the Reno Air Race for John Parker racing Blue Thunder II at 400 mph!